Contemporary German calf on wooden boards, rebacked. Four parts bound in one; 155 leaves (of 156), lacking 1 blank at the beginning, 176 leaves, 175 leaves, 191 leaves (of 192), wanting 1 blank at the end; a stub remains between the 58th and 59th leaves (conjugate with the 54th leaf). Its probable East European or German provenance can be seen in marginalia. On vol. I, fol.129, there is an early MS marginalia referring to the 1581 campaign of Stefan Batoriy, Polish King, against the Muscovites and connecting the event to passages from Ovid. On the lower margin of part 2, fol. 29v is written ‘Joannes Leonardi Pfalizell' with the mention of the year 1599. On part 1, fol. 2r, a German ownership inscription dated 1821 can be seen, along with a signature by another owner erased by pen. 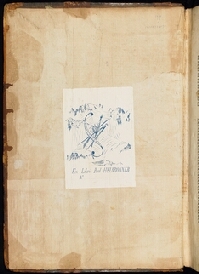 On the front paste-down, there is a bookplate of Paul Helbronner (with the motto ‘Perseverantia'), the famous Alpine cartographer at the beginning of the twentieth century. Maîtres Laurin – Guilloux – Buffetaud, Paris, 27 October 1997 sales catalogue. (Cf. Mostly British, p. 99).